The Center for Community Water Sports is a community based not-for-profit organization that seeks to make the region’s waterfront and all its on-the-water activities available to the general public with special emphasis to include the youth, the disadvantaged, and the physically and mentally challenged. As opposed to the gated and locked marinas and yacht clubs, we provide a place and a number of programs where everyone is welcome and urged to participate. We are not in competition with other providers, rather our role is to be facilitators. To bring together the potential users and the providers. To let the public in general public know what is available and how to take advantage of it and get involved. 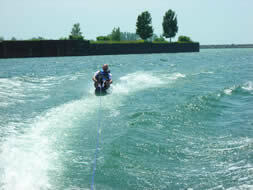 The Center for Community Water Sports is operated by the Great Lakes Water Sport Institute, a 501(c)(3) not-for-profit corporation As such we are able to accept donations that qualify for tax credits. Several of our boats and much of our hardware have been donated thru this program and we are always looking more that we can use. Our operations are guided by a Board of Advisors, volunteers representing a wide range of water sports interests, community based organizations, and community service providers. The Boards mission is to identify community needs and desires and suggest programs to satisfy the need. It is also instrumental in recruiting and coordinating providers and volunteers who can meet the program needs. The meetings are open and your input is welcome. Though starting small our vision is clear. We know what can be done because it has been done elsewhere. With a bit of work, some great volunteers, and some vision by our elected officials it will become a reality. The Center for Community Water Sportsâ seeks to meet the needs of all children, youth, families, and individuals in the greater Buffalo area, who have not been able to enjoy their waterfront for generations. We need a central location where a child can go to play in the sand, or learn to swim, or row a boat. Where a youngster can learn to sail, race, and compete with other youngsters. A place that can be home to high school teams and college teams, maybe even some will aspire to the Olympics. The Center will provide a place to learn SCUBA diving, marine ecology, water-skiing, and boat building, and so much more. A place to become home and serve as a meeting space for various clubs and not-for-profits promoting fishing, boating safety, disabled water sports, kite surfing, and more. The Center would serve as a place where local schools can have a waterfront presence to offer courses and experience in maritime traditions. 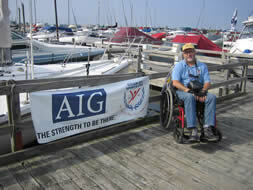 A place where a paraplegic can wheel his chair down to his boat and go out fishing. And last but not least, a place where a family can go and just enjoy a great summer day in the sun, watching the boats and enjoying all the activities and events. We envision just such a place on the Buffalo Waterfront. 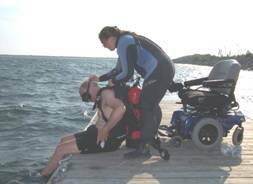 Last summer we operated out of the Inner Harbor utilizing space on their handicapped accessible dock. We are currently looking for a permanant location in the Buffalo Waterfront to complement and centralize our future activities for 2010 and beyond. 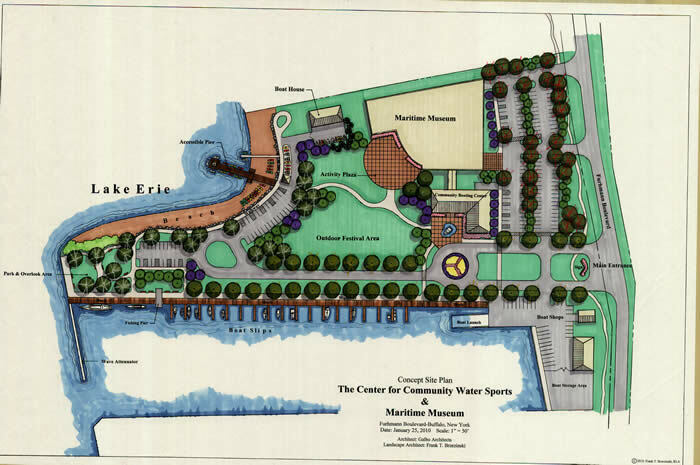 We are currently submitting a two phase proposal for development of the Center for Community Water Sports. The first phase is a relatively low cost R&R of an existing building with some extension of the dock and development of the shallow shoreline. It will serve the needs of the community during the time the organization and operation grow into itself and significant programs are organized and started. Assuming the programs are successful and the programs outgrow the facility, a new purpose built building will be built as a phase 2. This growing phase will afford enough time to assess the success of the project and find appropriate funding. A broad list of the types of programs we hope to facilitate and develop follows. This list is by no means all inclusive. We invite anyone with an idea to suggest it. We will support anyone who volunteers to start or staff a program if it’s within our realm to do so. Many of the programs are or will be operated out of our facility however some are already operating successfully in other places and are included here for reference. As programs get underway and become a reality, they will have their own web page with full descriptions and details. We need volunteers who will help with the programs and share their knowledge and experience. We need sponsors to help us defray costs and gain recognition as helping a good cause. Most of all we need clients who come down and use the facilities and participate in the programs.